On Wednesday morning, JF Berube cleared waivers and was sent to Rockford. His replacement on the Blackhawks roster: Collin Delia. If/When he appears in an NHL game, Delia will play for all three levels of the Blackhawks organization in one season. He has appeared in 10 games wit the ECHL’s Indy Fuel and 24 games for the Rockford IceHogs in the AHL. 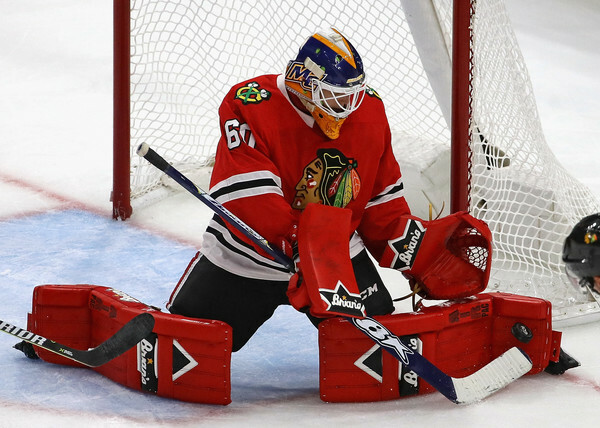 Delia, 23, signed with the Blackhawks as a free agent last summer after three years at Merrimack College (Hockey East). Has done well in his after getting recalled to Rockford, deserves a look. Can’t be ANY worse than the other guys. Nothing to lose at this point. The red goalie pads are aesthetically pleasing! So at least there is that! Yep, I agree there’s nothing to lose. However, I seem to recall that Delia played some in the preseason. FWIW, Berube looked like Tony Esposito compared to Delia. Delia looked shaky to say the least. Berube is a technical sound goalie. Classic French Canadian butterfly style goalie. Visually he looks stylistically like Crow. He plays very claim in the crease like Crow. Unfortunately all that being said he isn’t an NHL caliber goalie. It’s ashame. 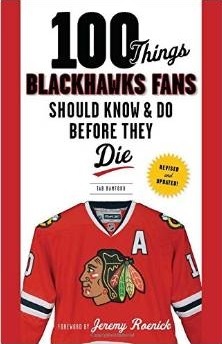 I think the Hawks are trying to help Rockford get into the playoffs thus the moves of Highmore and Kampf to Rockford. Not so sure about Berube and Delia since Delia has been Rockfords best goalie of late. Maybe the experience factor and a chance to see Delia at the NHL level. Get him a few games. Congrats to the kid. I just hope the d plays good in front of him. Be sad that he made some gain only to have his confidence shattered suddenly because of the Hawks poor defense. Wonder, with Pesce and Slavin due to have 6 and 7 year deals respectively kick in next season and Faulk locked in for 3 more years. Would they move Hanifan rather than lock try to lick in another dman on a long term higher hit. Could be somebody worth a inquiry. I like your thought process the Canes have a strong pipeline of defensive prospects and likely aren’t going to be paying everyone. Hanifin would be a nice player. Not sure if u saw but their new ownership is looking for a new GM at the low salary of 400k. That’s definitely a team SB should be talking to. I was thinking that too, could be good to deal with. Wraparound they just extended Pesce on a 6 year 4m/ yr deal starting next season and he wasn’ t arbitration eligible. Being a budget team and 3 dmen locked up at 4m+ for next 3years i would be surprised if they want to go there again or would want to move one of the others. Nobody ever talks about Hjammer deal, but I bet that hurt as much as losing Panarin this year. He only has one more year on current contract. Maybe we could resign him if he goes UFA although who knows how he feels after being sent into exile in Phoenix. His last deal was very cap friendly, but before that he signed the offer sheet which hurt us at the time. Probably too expensive for us without moving another contract (AAs would free up some room though). I’m usually not for getting the band back together type moves, but he is a warrior. I’d be very surprised if Carolina traded Hanifin. They have their top-4 of the future and none of them are over 23 – Hanifin (21) Fleury (21), Pesce (23) and Slavin (23). And they’re all over 6’0″ and over 200lbs. I wouldn’t be surprised if they traded the old man in the bunch – Faulk (26) before they trade Hanifin. The 6th d-man is TvR (26) who also needs new paper – but he shouldn’t demand as much as Hanifin. If this guy is single, I know a woman named Delia, if they were to meet and get married, her name would be Delia Delia. As Carolina became my 2nd fav team when Teuvo and Aho got there, I have watched about 3/4 of their games this year. Hanifin is a Stud 2 way D-man in the making. Still learning but he learns quick and doesn’t often make the same mistakes twice. Slavin is very underrated, he should be a perennial norris candidate soon, he’s that good. Pesce is similar to how Seabrook was, with a little less offense, lighter shot, and less size/physicality. But Pesce is just starting to develop or show his offensive instincts and it looks like there is more to come from him. Faulk is a massive train wreck in his own zone ala Erik Karlsson and a huge reason the Canes aren’t having a much better season. Haydn Fleury shows potential but not with the ceiling nor development curve speed as Hanifin. I suspect the available d-men from Carolina would be Faulk, (no, just no), Fleury (worth taking a gamble on but not ready for top 4 yet), TVR (can’t believe I’m saying this but he’d be better than Oesterle and Gus in his own zone at least), and Dahlstrom (who we gave to them and I wouldn’t be too upset giving him a shot as as a 3rd pair guy either though much rather it be Forsling or Jojiharku or Miller or Snuggerud or Tuolola etc). I really doubt the Canes part with Hanifin but if they will, damn yes grab him and give them Anisimov and Jurco and a 2nd or 3rd pick if that’s what it takes. Hanifin should be a top pairing guy within 2 yrs and a solid 2nd pairing guy right now. Tab did the Hawks ever sign that German forward Dominick Kahun or are they still checking him out. With the new majority owner Dundon taking over the Canes and forcing Francis aside and looking for a çheap yes man replacement, predicting what he will do is basically impossible. I just meant Bowman doing his dilligence and inquiring could be worthwhile. If nothing there then move on but if there is who knows what this guy might do. EB what you say makes perfect hockey sense but Dundon sounds like a my way or the highway guy. If he thinks Hanifan is asking too much he could say see ya just as easily as not too. re: Kahun – haven’t seen anything official.